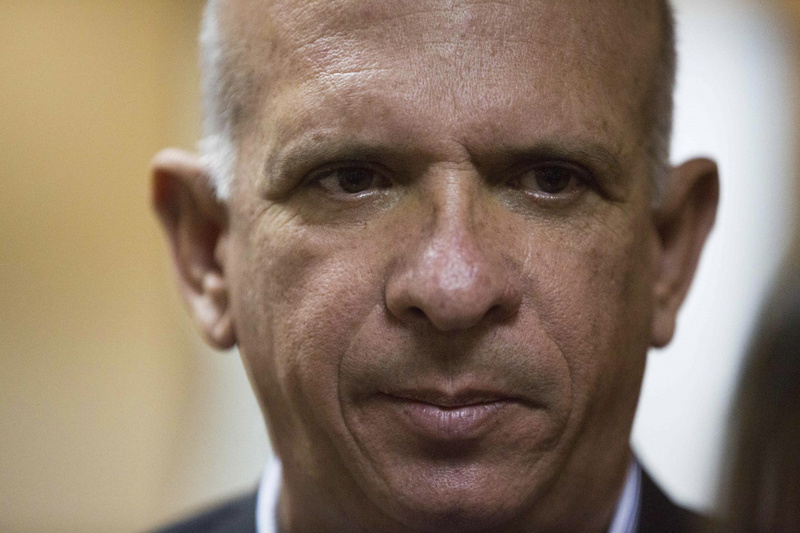 MADRID (AP) — Venezuela's longtime spy chief was arrested Friday in Madrid by Spanish police acting on a U.S. drug warrant a few weeks after he threw his support behind opponents of President Nicolas Maduro. The arrest of retired Maj. Gen. Hugo Carvajal, who for more than a decade advised the late leader Hugo Chávez, was celebrated by U.S. law enforcement officials who watched helplessly as the spymaster slipped from their grips five years ago when he was picked up in Aruba on the same New York indictment used to order Friday's arrest. But some analysts said his surprise detention might have a chilling effect on Venezuela's opposition. The opposition saw Carvajal's criticism of Venezuela's socialist government as a stimulus to prod other military figures to defect, but the country's armed forces have remained largely loyal to current Maduro. Prosecutors in New York alleged Carvajal used his high office to coordinate the smuggling of approximately 5,600 kilograms of cocaine from Venezuela to Mexico in 2006, according to the indictment. A spokeswoman with Spain's National Court, which handles extradition cases, said that Carvajal would testify Saturday before a judge in Madrid. He can either accept the extradition to the United States or fight it before the court, explained the official, who wasn't authorized to be identified by name in media reports. Carvajal, who climbed the ranks in Venezuela since he befriended Chávez in the early 1980's, is no stranger to U.S. law enforcement agencies. In previous indictments, authorities also named Carvajal as part of several high-ranking Venezuelan military and law enforcement officials who provided a haven to major drug traffickers from neighboring Colombia. The group became to be known in Venezuela as the "Cartel of the Suns" because top officers in the country wear sun insignias on their uniforms. Carvajal also allegedly provided weapons to armed FARC guerrillas in Colombia, according to the U.S. Treasury Department, and helped fund the group's activities by facilitating shipments of large amounts of U.S.-bound cocaine through Venezuela. In 2014, he became the highest-ranking Venezuelan official ever arrested on a U.S. drug warrant. But authorities in the Dutch Caribbean island of Aruba, where Carvajal was serving as Venezuela's consul, refused to extradite him under intense pressure from Maduro. Carvajal, known in his country by the nickname "El Pollo (the Chicken)" eventually returned home, where Maduro received him as a hero, but soon after took a low-key presence in the country's turbulent politics. In 2017, he broke with the Venezuelan government over Maduro's plans to create a constitutional assembly that gutted what was left of the opposition-controlled congress. In mid-February, when Carvajal announced his support for opposition leader Juan Guaidó in a video distributed on social media, the former spy chief said Venezuela's military was in as ramshackle a state as the nation as a whole. "We can't allow an army, in the hands of a few generals subjugated to Cuban instructions, to become the biggest collaborator of a dictatorial government that has plagued people with misery," he said at the time, asking fellow military to join him. As recently as two days ago, Carvajal remained hopeful that other former peers would follow his steps. But despite constant pleas by Guaidó and the Trump administration for them to flip, the Venezuelan military remains largely behind Maduro. "I have no doubt," he wrote in his Twitter feed, that "Maduro will leave by a decision of the Armed National Force." Former American diplomat Roger Noriega said hopes in U.S. intelligence and foreign policy circles that Carvajal could serve as bridge for other top-ranking generals to defect were misguided. He said that the culture of corruption that Carvajal represented and has long plagued Venezuela is precisely what needs to be uprooted. "How did a narcogeneral from Venezuela, who has been indicted in the US, evade Interpol red notices to travel to Europe?" said Noriega, who oversaw policy toward Latin American at the State Department during the presidency of George W. Bush. "Last time he was arrested, the Obama administration let him slip away. I hope the U.S. government won't let that happen again."